We present you in our best list current PS4 controllers for every need, from high-end devices for multiplayer shooters to inexpensive second controllers for local matches. From cheap to expensive, with special skins or special keys, in custom versions or quite simply in the standard version from Sony: PS4 controllers there are plenty. In our comparison, we present you with current alternatives for controlling your PlayStation and tell you which one is best for what. On the first page we introduce you to controllers that are particularly suitable for a certain purpose. On the second page you will find our all-round controller recommendations. Finally, you’ll find a few tips for connecting your controller to your console or PC. Since Sony, unlike Microsoft, has not brought its own elite controller onto the market, the Nacon Revolution Pro 2 occupies this position to a certain extent. With a price of about 100 Euros it is clearly more expensive than the standard controller, but also offers a lot. Adjustable by weights: The Revolution Pro 2 allows the weight to be adjusted via two inner chambers into which one or two of the six weights supplied can be inserted. This makes the controller in Xbox design also suitable for larger hands. Four freely configurable shortcut keys are located on the underside, and the control pad can also be used as a four-way or eight-way version. Configurable profiles: Particularly interesting for pro gamers is the special software that allows different profiles to be configured. The response curve of both sticks, the vibration intensity, the LED illumination and the sensitivity of both trigger keys can be set. The latter makes the Revolution Pro 2 very well suited for racing games or titles such as Rocket League, where you like to control exactly how much you accelerate. The Revolution Pro 2 works exclusively via cable connection, via a three meter long USB-C cable. It is also equipped with a 3.5 mm jack for headsets. Conclusion: The many configuration options allow pro gamers to tailor the Revolution Pro 2 exactly to their own needs. 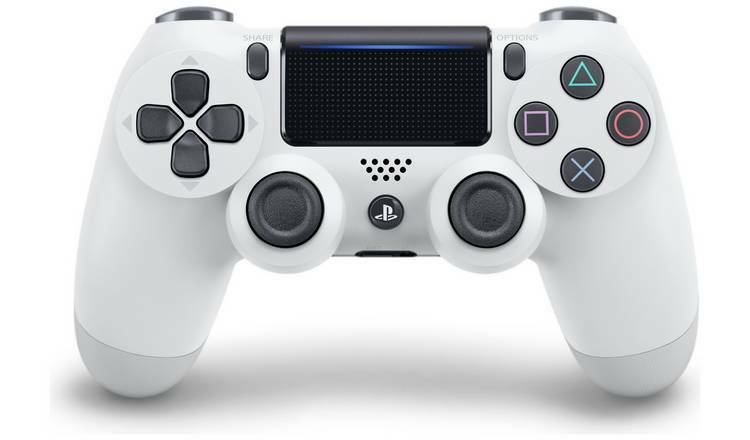 You can argue about whether it is the best PS4 controller on the market, but the alternatives that could compete with it are much more expensive. If you use your PS4 only occasionally, you can get even cheaper models. Razer claims to have developed the Raiju controller especially for the e-sports sector. For the proud price of a good 100 euros, the Raiju also offers lots of extras. Additional keys: A total of four additional, freely programmable keys are located on the back and underside of the controller. The two trigger buttons on the underside can be removed on request. In addition, the Raiju has a Quick Control Panel that can be used to change key profiles, mute the microphone or adjust the chat volume. Between Xbox and PS4 controller: The design of the Raiju is a mixture of PS4 and Xbox controller: The keyboard layout is based on that of the PS4, haptically the Raiju feels more like an Xbox controller. With a weight of 350g, it is significantly heavier than the Dualshock 4, making it particularly suitable for larger hands in combination with the generous case dimensions. In addition, the Raiju has a combined 3.5 mm jack connector for stereo headsets and headphones. Connection to the console is via the approximately three meter long micro-USB cable. If you like, you can adjust the analog sticks with two separate rubber caps. Conclusion: If you frequently use your controller in conjunction with a headset for multiplayer games, you will benefit from the additional control panel. Especially in a team-based Shooter Overwatch or Fortnite it is helpful to be able to switch the microphone on and off without having to take your hand off the controller. But for those who don’t use such features, the price is too high. The Wired Compact Controller from Nacon is after the Snakebyte Game:Pad 4 S (see page 2) the cheapest PS4 controller in our list. Like Sony’s Dualshock 4, Nacon’s Wired version has a built-in touchpad and a 3.5 mm jack for stereo headsets. Economical equipment: With the low price of the controller of approx. 35 Euro, however, buyers have to do without some features: The Nacon Wired Compact has neither a motion sensor nor a light bar or integrated mono speakers. A wireless Bluetooth connection is also missing. Instead, you connect the controller to your PS4 (or PC) via a three meter USB cable. For small hands: The Nacon Wired Compact is about the size of Sony’s Dualshock 4, but it’s a bit chunkier. Large hands could have some problems with the handling similar to the original Dualshock 4 from Sony. So it’s best to take the controller into your own hands before you buy it. Conclusion: The Nacon Wires Compact Controller is basically a cheap and reduced version of the standard Dual Shock 4 controller. To use it as a main controller, the bid is too little. But if you’re looking for a second controller for occasional local multiplayer games, you’ve come to the right place. Playing Shooter on the console sometimes makes you want a mouse to aim at. The Japanese manufacturer Hori therefore offers the TAC Pro, a combination of mechanical keyboard and mouse that Hori wants to bring the PC gaming experience to the console. Many keys: For the price of about 140 Euros you get a keypad with 20 mechanical switches and wrist-rest as well as a wired mouse. On the side of the pad is an LED display and an analog stick with an additional Quick button. In the game itself, the mouse emulates the right stick, while the keyboard is responsible for the rest of the controller. Configurable: Using the TAC Pro software you can create up to three separate user profiles, which store the key assignments as well as settings for mouse sensitivity and lighting. The configuration takes place directly via the display on the pad itself. It takes some time to get used to the settings and the feel of the keyboard. Even after that, the gaming experience on the PC isn’t quite achieved, especially as console games aren’t optimized for mouse control. Nevertheless, the TAC at least comes close to its target. How well you get along with the handling depends not least on the environment. Even though the TAC Pro is better suited for playing on the couch than a real PC keyboard, it is best kept on the desk. Those who are more at home on the PC and simply can’t get used to controlling a shooter with the controller will get help here. Experienced consoleros, however, can do without the TAC Pro, especially as the advantage is not as big as one might think. Before we get any pro tips, we’ll start with a series of basic tips to help you optimize your gambling sessions. After all, we don’t want your gameplay experience to be held back by small things, but to unfold properly. There are many things you can do. However, before you desecrate your wallet and buy expensive gaming equipment, let’s start with the little things. With the very small ones. To be able to pursue your hobby undisturbed, an appropriate environment is important. Switch off your smartphone for a change, send your girlfriend shopping and feed the cat so she doesn’t beg for treats. Then make sure you have the right lighting and find a comfortable seat so you don’t have to strain your back, neck or eyes too much and spend more time in front of the screen. Of course you should also eat the right food when playing. Avoid overly sweet things, drink water instead of Coke, and avoid alcohol when you’re online with other players, so you can concentrate better. This and more should be the standard policy for every gambler. In the following picture gallery we have ten tips for you. What else can you think of? Leave us a comment below the article!